If you’re looking for a quick, easy pattern that will just about knit itself then this baby has your name written all over it. It’s a super easy, knit-in-the-round (all the way up the armpits) jumper that self stripes so you don’t have to do much else to add interest to the design. 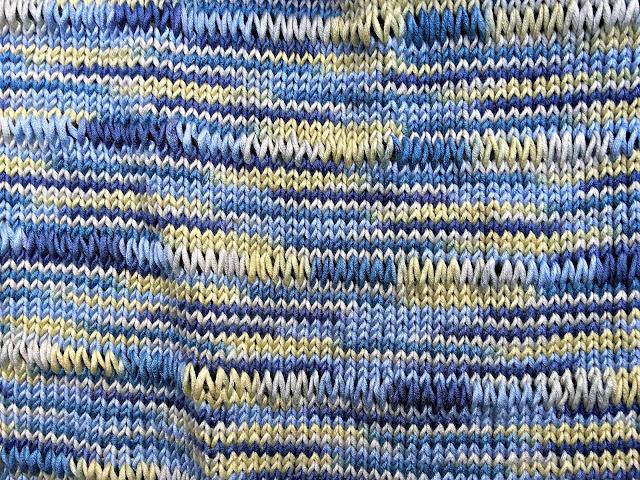 I’ve gone all out with a simple open work texture created by double-wrapping the right needle on every 10th row to create a drop stitch row that makes it look even more summery and beach-casual. Then on the next row (row 1 on the pattern repeat) you simply knit each double loop once to produce a row of extra long stitches that creates the textured open work. 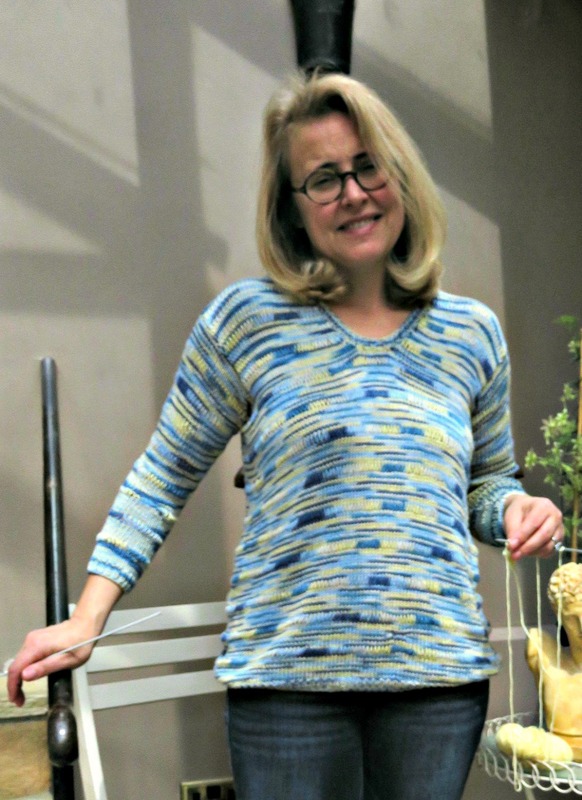 It’s conceived as a loose fitting, anything-goes kind of look that measures 20”/ 51 cm from armpit to armpit, and measures 45 cm/ 17.5” from the armpit down to the bottom of the waistband. 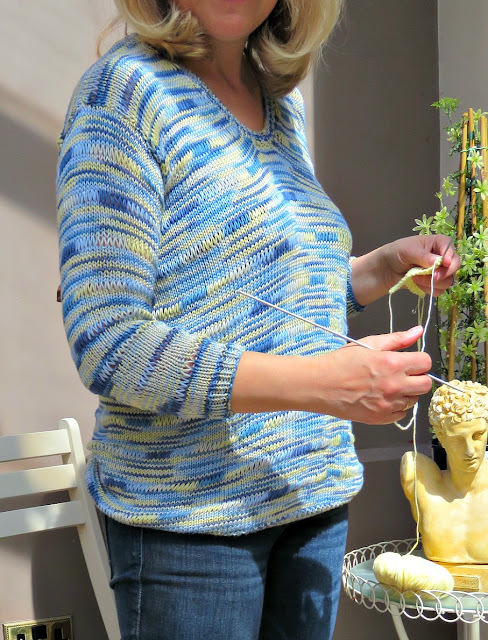 I've knit it in Costa Brava Knitting's DK Bamboo in Cobalt & Lime. This yarn knits to a tension of 22 stitches x 28 rows on stocking stitch on a 10cm x 10 cm square, and I used 400 g of yarn to knit this baby. That's 8, 50 g balls or around 800 metres of bamboo yarn. It's a lovely silky yarn with great drape. So let’s get started on the body. Using 3.25 mm needles cast on 202 stitches, and, being really careful not to get things twisted, join to form a perfect circle with a nice tight knit stitch, which will be the first stitch of the first row. 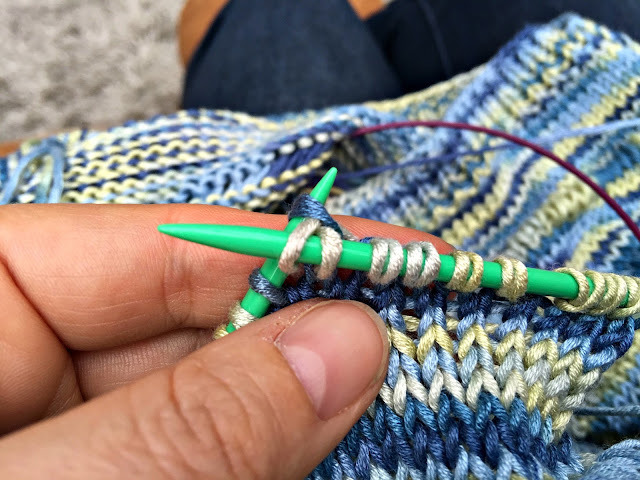 Mark the beginning of the row with a stitch marker or a looped strand of contrasting wool so that you’ll know where you are and when you’ve finished a row. Now work the waistband in K1/P1 rib all the way around, ending with a purl stitch. You need to work 8 rows in this rib stitch to create a bottom cuff. Change to 3.75 mm needles and carry on in pattern until the body of the jumper measures 45 cm/ 17.5”. It looks pretty summery, doesn’t it? And it’s not something that takes a lot of thought to get right. 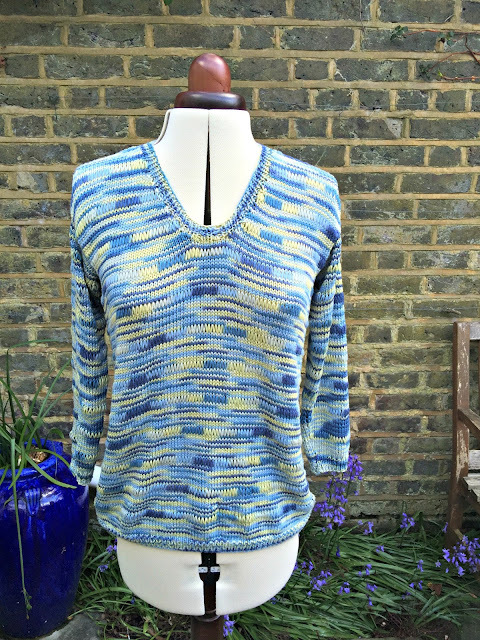 When you’ve knit 45 cm/ 17.5” – or whatever length works best for your body shape – you may have a longer or shorter torso/ you may want the jumper to fall over your hips. My version falls to below my natural waistline to skim my hips. Having worked our way up to where the armholes will be we’re going to work the remainder of the jumper in the flat; first the left front and then the right front, back and forth separately to create an armhole and to shape the neck. And remember that once we start working the pattern in the flat we'll have to knit all the odd rows and purl all the even ones. Please keep place with the 10 row pattern of the body over the following rows. Row numbers for shaping the front will not necessarily reflect your pattern row numbers for accurate pattern repeats. Row 1: Cast off 10 stitches knit-wise to shape the armhole. Knit the next 37 stitches. Place the following 7 stitches on a stitch holder, and turn. Row 2: purl 2 together, purl to the end of the row (36 stitches). Rows 3 and 4: work in pattern. Row 5: knit to last 2 stitches, knit 2 together. Rows 6 and 7: work in pattern. Row 8: purl 2 together, purl to the end of the row. Rows 9 and 10 work in pattern. Row 11: knit to last 2 stitches, knit 2 together. Rows 12 and 13: work in pattern. Row 14: purl 2 together, purl to the end of the row. Rows 15 and 16: work in pattern. Row 17: knit to last 2 stitches, knit 2 together. Rows 18 and 19: work in pattern. Row 20: purl 2 together, purl to the end of the row. Rows 21 and 22: work in pattern. Row 23: knit to last 2 stitches, knit 2 together. Rows 24 and 25: work in pattern. Row 26: purl 2 together, purl to the end of the row. Rows 27 and 28: work in pattern. Row 29: knit to last 2 stitches, knit 2 together. Rows 30 and 31: work in pattern. Row 32: purl 2 together, purl to the end of the row. Rows 33 and 34: work in pattern. Row 35: knit to last 2 stitches, knit 2 together. Rows 36 and 37: work in pattern. Row 38: purl 2 together, purl to the end of the row. Rows 39 and 40: work in pattern. Row 41: knit to last 2 stitches, knit 2 together. Rows 42 and 43: work in pattern. Row 44: purl 2 together, purl to the end of the row. Rows 45 and 46: work in pattern. By this stage you should have 22 stitches on the needle. Place these stitches onto a stitch-holder. They will be joined as live stitches to the corresponding stitches on the back using a Kitchener seam. Or if you really don't want to do a Kitchener seam you could cast them off and simply sew the shoulder seams together. Working a Kitchener seam is not difficult. I've set out how to do it here in my Bamboo baby dress pattern. Row 1: Join the yarn on the other side of the 7 stitches held on a stitch holder and knit across 47 stitches. Row 2. Cast off 10 stitches purl-wise to shape the right arm-hole. Purl across to the last 2 stitches, and purl 2 together. Row 5: Knit 2 together, knit to the end of the row. Row 8: Purl to the last 2 stitches, and purl 2 together. Row 11: Knit 2 together, knit to the end of the row. Row 14: Purl to the last 2 stitches, and purl 2 together. Row 17: Knit 2 together, knit to the end of the row. Row 20: Purl to the last 2 stitches, and purl 2 together. Row 23: Knit 2 together, knit to the end of the row. Row 26: Purl to the last 2 stitches, and purl 2 together. Row 29: Knit 2 together, knit to the end of the row. Row 32: Purl to the last 2 stitches, and purl 2 together. Row 35: Knit 2 together, knit to the end of the row. Row 38: Purl to the last 2 stitches, and purl 2 together. Row 41: Knit 2 together, knit to the end of the row. Row 44: Purl to the last 2 stitches, and purl 2 together. By this stage you should have 22 stitches on the needle. Place these stitches onto a stitch-holder. They will be joined as live stitches to the corresponding stitches on the back using a Kitchener seam. The back (101 stitches) will now be worked, back and forth, in the flat knitting the odd rows and purling the even ones. Row 1: Cast off 10 stitches, knit to the end. Row 2: Cast off 10 stitches, purl to the end. By the end of row 2 there will be 81 stitches on the needles. Work rows 3 to 41 in pattern (without any further stitch decreases). Remember, as with the front, the 10 row pattern has to be worked consistently over the back. You will end row 41 with 81 stitches on the needles. Row 42: Purl 22 stitches. Cast off 37 stitches to shape the back neck. Purl remaining 22 stitches. Work Rows 43 to 46 in pattern on the left side of the neck. Cut the yarn and join to shape the right back. Work Rows 43 to 46 in pattern. Cut the yarn. Graft the left front and back shoulder sections with a Kitchener seam, and do the same for the right front and back shoulder sections. An explanation as to how to work the Kitchener seam can be found here in my pattern for a Bamboo baby dress. Holding the body with the right side towards you, and starting at the centre of the bottom seam of what will form the armpit, pick up 68 stitches evenly all the way around the opening for the arm. Join when you get all the way round and mark the beginning of the row with a stitch marker, and work in the round in pattern, doing an open stitch row every 10th row, as before with the body of the jumper. At the beginning of every third row, decrease the number of stitches by knitting the first two stitches together i.e. you will decrease by one stitch every third row. This seam of stitch decreases will be concealed on the underside of the arm - hence the importance of starting the row at the centre of the bottom seam of the armhole. 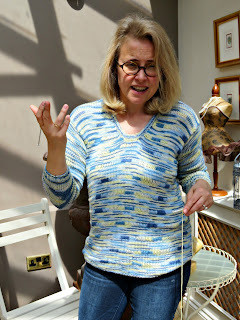 I carried on in this way for 89 rows, by which stage I had 39 stitches left on the needles and a sleeve that came to below my elbow but above my wrist – bracelet length I think it’s called. This sleeve was perfectly fitted to my lower arm. Check the fit and length as you go along. Just slip your arm into the sleeve and make sure that it's shaping up to fit. If you have thinner/thicker/longer/shorter arms you may not be happy with my specifications. Stop decreasing when you have achieved the perfect sleeve-width for your arm, and carry on without any further decreases until you have your perfect length. We’re all different and knitting should never be about a one-size fits all proposition. When you’re happy with the sleeve, finish off with a knit 1/ purl 1 rib. Switch to 3.25 mm needles and work 6 rows in rib before casting off in rib. Now go and do the same thing on the other side for the other arm. Slip the 7 stitches from the stitch holder at the centre front onto a set of 3.25 mm circular needles, mark the central stitch with a stitch marker. It is important to know which one is in the middle as we’re going to shape the neck around this central stitch. Pick up a further 97 stitches evenly around the neck opening as follows: 33 along each side of the front V and 31 across the back. Adding the 7 stitches from the stitch holder you will have a total of 104 stitches on your needles. Close the circle and knit in the round. The first of the 7 stitches from the stitch holder will be the first stitch of the row. Mark the beginning of the row with another stitch marker. Row 1: *Purl 1, Knit 1* Repeat from * to * to end of the row, ending with a knit stitch. By starting with a purl stitch, the central stitch, marked with a marker will be a knit stitch. Row 3: Purl 1, purl 2 together, knit 1, purl 2 together, *purl 1, knit 1*. Repeat from * to * to the end of the row. Row 4: Purl 2, knit 1, purl 2, knit 1, *purl 1, knit 1*. Repeat from * to * to the end of the row. Row 5: Purl 2 together, knit 1, purl 2 together, knit 1, *purl 1, knit 1*. Repeat from * to * to the end of the row. Cast off in rib. Darn in your loose ends and you’re done. Ta-dah!